Put your spacial and temporal awareness to the test as you help Axel and Ounce escape the underground lab! Like the other feedbacks, the game felt confusing to me. I never get to manage to end the first level. I'm sorry that the game was really confusing. I knew the levels I had were too difficult, but I ran out of time to make easier/tutorial levels for the beginning of the game. 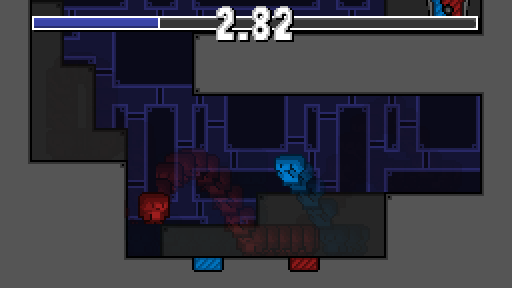 I will definitely take more time to introduce game mechanics in the future. The mechanic is really interesting but is hard to master. The game need a more in depth tutorial with easy levels. I found the jump a bit unresponsive for this type of game. 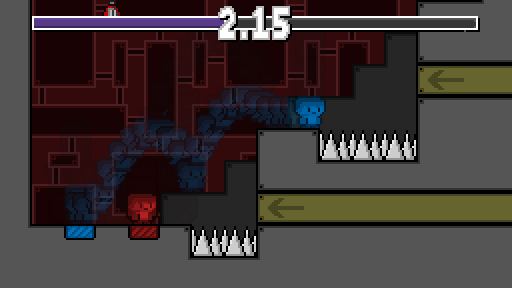 Dying on the spikes because a bad jump timing is really frustating. The art is nice and i noticed a lot of details in the UI part, sounds are good too. Really slick design and a very cool mechanic, but I found it hugely frustrating (particularly dying and starting again). THIS IS SO CONFUSING. And I've made a full GM48 game with similar mechanic (but not in inverse order). It really need some better introduction than the first level here. I took me forever to get past it. But I gave up on the third level. The real thing that makes the game so frustrating is the fact that you keep getting crushed. It makes the whole thing very punitive as you're just trying to understand how everything works. Other that that, the game is pretty cute and sound is good (but SUPER LOUD, I had to put it a 2% on my volume control..). And of course the idea is very interesting and fits the theme well, too bad there's not really room for testing and improvement (so level design problem). Thanks for the feedback! I knew the first level of the game was too difficult, but I didn't have time at the end to make a proper tutorial level. I also realize now that having the two players crush each other may not have been the best idea for a puzzle-oriented game. It might have been better if you could only crush yourself on ceilings (or not at all). Very unique idea combined with simple but beautiful art and music. However, the game is very frustrating and I think, since the mechanic is so new, needs a better introduction other than the story one. Thanks for your input! I knew the game was going to be frustrating when I submitted it, but I didn't have much time to add new (easier) levels before the deadline. I'll definitely tone down the difficulty in the beginning next time.